Dubai Marina is a district in Dubai, United Arab Emirates. 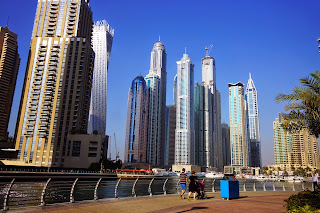 Dubai Marina is an artificial canal city, built along a two mile (3 km) stretch of Persian Gulf shoreline. When the entire development is complete, it will accommodate more than 120,000 people in residential towers and villas.